Powerscourt waterfall is a waterfall on the river Dargle in County Wicklow. It is the highest waterfall in all of Ireland. from the Main Powerscourt Estate, it is six kilometers away. This is a beautiful spot for tourists to revel at the natural splendor, the forest and the waterfall of an area that is untouched by man. In the foothills of the Wicklow Mountains, this waterfall is the crown jewel of the most beautiful park-lands of Ireland. Set at the foot of the Wicklow Mountains, Powerscourt Waterfall is a place for your soul and heart. It’s very close to Enniskerry town and only 5km from world known Powerscourt Gardens. Though the Powerscourt waterfall is a natural wonder and a site of utmost beauty, it has also been the subject of a very interesting plot to kill King George IV during his visit of Ireland in 1821. Richard Wingfield who was the Viscount of Powerscourt at the time decided to dam the waterfall, and then release all the built-up water in an attempt to drown King George. However, the king simply did not leave the banquet in the Powerscourt House, and thus got lucky in surviving the waterfall! The waterfall is a favorite location for tourists and local Irish people alike. It is a wonderful place to plan picnics and family gatherings. The surrounding woods are perfect for bird watchers and botany enthusiasts alike. Chaffinch, Cuckoo, Raven and Willow Warbler are only some of the species which inhabit these areas and can be heard singing with bliss. You can sometimes spot a Sika Deer as well. Some of the tree species which grow freely there include Beech, Larch, Pine and ad few more. It is also home to Giant Redwoods, which are ancient trees that can live up to 4000 years and grow 80 meters high! There is absolutely no shortage of space and grounds for children to run around in a limitless space. There is a playground for children as well. For adults, there is a kiosk for all types of treat to beat the sun or to simply enjoy with the view. It is open from June to august. The waterfall and the parkland has been developed to handle larger numbers of tourists. These developments include a large car parking, there are sanitary toilet facilities as well. There are numerous woodland pathways that lead the tourists through the woods and helping them to explore some beautiful flora and fauna without getting lost. The Waterfall is an perfect destination and a place for your summer picnics and barbecues. Your kids has lots of space to run around and keep them busy. On the site there is a playground for younger kids. But be mindful of the other inhabitants of the parkland! It is a haven for wildlife and children can have fun trying to spot some of the locals – the Chaffinch, Raven, red squirrel, Cuckoo, the Willow Warbler and the Sika Deer . The Sika Deer were introduced to Ireland in 1858. For visitors pleasure, there is a kiosk on site, where you can buy hot coffee or tea and some snacks including hot-dogs as well as ice-creams. There is ample car parking and toilet facilities at the waterfall. Dogs are alowed but must be kept on a leash. you can have an entire day of outing, exploration, sightseeing and picnicking. This sounds like a perfect day for anyone. However, there are many additional perks to getting an annual membership. These include some exclusive walks that cover some amazing and secret woodland trails. The river walk is an exclusive walk like this, which was made for the Viscount of Powerscourt and his family to enjoy the splendor of the river up close and in solitude. • Annual membership allows unlimited entry to Powerscourt Estate, Gardens and Waterfall during normal opening hours. • The price for ndividual membership is €95.00 and family membership costs €165.00 -that’s for two adults and up to four children. Call into the reception at Powerscourt House or at the Gatelodge at the Waterfall entrance to buy e your annual pass. More info about annual membership of Powerscourt at Powerscout House. Powerscourt Waterfall is situated 6km from Powerscourt Estate. Coming from Dublin and Wexford take Exit no 8. After 2 km take the first left towards Enniskerry and follow the signs for Powerscourt Waterfall. To see a map of Powerscourt Waterfall, click here. We would not recommend walking to the waterfall from Powerscourt Estate as there are no footpaths for part of the journey. Car / Taxi are the best options for visiting the waterfall. 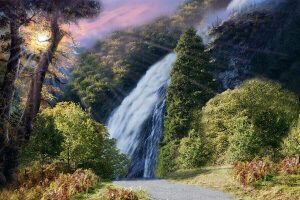 Powerscourt Waterfall offers you an opportunity to satisfy your explorative urges, and your desire to have a splendid outdoors day full of adventure and non-stop fun with friends and with your family.